I had extensive bonding on teeth to improve some wear and chips. I hated it as it felt bulky and I couldn’t speak properly. 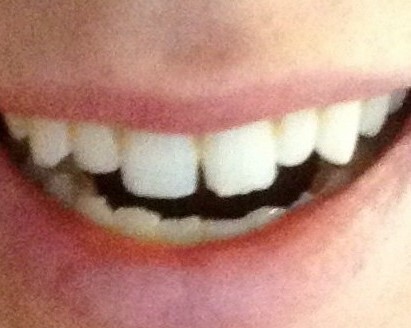 I had it removed but my teeth have been left patchy and discoloured. My dentist and the one she referred me to for another opinion both tell me it’s my natural teeth and I just hadn’t seen it before. I’m devastated as feel my teeth have been damaged. I can’t fully tell what has happened to you without seeing your case personally, but I can make a good guess based on what you are telling me. It sounds like you are in the hands of a basic general dentist who doesn’t know enough about cosmetic dentistry to give you a beautiful smile, and there are two things that were done wrong. The first is that your bonding made your teeth bulky, so much so that it interfered with your speech. Dental bonding should never add significantly to the bulk of the teeth. That doesn’t produce an attractive appearance, plus it can interfere with speech, and it could create food traps that can lead to either tooth decay or gum disease. I don’t understand, if you’re just dealing with wear and chips, why you would need any bulk at all added to your teeth—the dentist should be able to just fill in the chips and replace tooth structure that has worn away. Look at the photographs of dental bonding work on this website. None of them look bulky at all. The second mistake was in removing the bonding. While some dentists who lack confidence in their cosmetic dentistry skills will tell patients that dental bonding is a reversible procedure because it can simply be ground off if you decide you don’t like it, that may not be as easy as it sounds, especially in the hands of a basic general dentist. So the dentist starts grinding off the composite bonding and stops when he or she hits the enamel. But the composite looks just like the enamel, so how do they know when it stops? In this process, it is very easy to believe that your dentist may have removed a small amount of the enamel of your teeth. I don’t know—I’m just guessing. But you clearly know that they don’t look the same as they did. Of course she’s going to want to tell you that this is how your teeth were. And as far as the dentist she referred you to, there is no way for that dentist to tell you how your teeth used to look or whether any enamel was removed. Your complaint is very credible to me. If your teeth were always splotchy, that would have been your chief complaint and the reason you got the bonding, and you would certainly know it. A good cosmetic dentist would have taken “before” photographs, and there would be no argument then about how your teeth looked before the work was started. So what do you do now? I would go to an expert cosmetic dentist and either have this bonding done correctly or go with porcelain veneers, which will be the much more durable and cost-effective alternative. You should be able to get a beautiful smile out of this. We have an excellent cosmetic dentist listed in London, and I see by the city you mentioned that you are just outside of London. He should be able to take care of this for you. I think your leverage for a claim against your current dentist is rather weak, because of the lack of documentation of what you are saying. Maybe you can get some kind of refund from her, but it seems to me that this would be entirely voluntary on her part. I had bonding done on 3 front teeth 5 days ago. I used baking soda and wondered if I should’t have because now they look yellow. I was soooo happy to have fairly straight teeth, but now they look yellow. Is there a product available to whiten bonded teeth? Baking soda, unfortunately, used as a toothpaste, is very abrasive, and can damage the polish on the bonding. And no, there isn’t a product available to whiten bonded teeth. Since this is so recent, I would return to the dentist that did the bonding and ask him or her if they would mind just freshening the polish for you. And then I would switch to Supersmile toothpaste. Supersmile was designed for the maintenance of dental bonding work. There is a possibility that I should mention and that is that the dentist could have used inferior materials for the bonding. I hope that isn’t the case, but knowing that the vast majority of general dentists have a low level of expertise in cosmetic dentistry, I worry about that. It bothers me a little that it doesn’t seem that they gave you thorough post-operative care instructions for bonding. If you go through this process, use the Supersmile toothpaste, and the yellow comes back (or never goes away), then you may need to check out one of our recommended cosmetic dentists to fix this. The entire bonding probably wouldn’t need to be re-done, but it may need to be re-surfaced in a better material with a better polish. I am an orthodontist and recently had a 24-year-old Hispanic man come for treatment with severe fluoride staining. In your experience, would you expect braces to have acceptable bond strengths to be useful for two years of treatment? Is there a special protocol to help? I’m going to generalize my answer so it is useful to as many people as possible. My experience, of course, was with doing dental bonding procedures on patients with fluorosis. For the lay person reading this post, that is the clinical name of fluoride staining, and it comes from consuming excessive amounts of fluoride during childhood. We don’t see it too much in the United States, because the vast majority of our water supply is adjusted for optimal fluoride content. I’m guessing that this Hispanic man grew up in another country, which may explain the fluorosis. I did not see extreme fluorosis in my practice, but did see mild to moderate fluorosis, and never had any problem bonding to those affected teeth with normal etching. If the staining is severe, my understanding is that the recommendation is to double the etch time. There was a study done on this some years ago, and I believe that was the conclusion, and I concluded from the data that doubling the etch time, when fluorosis is severe, should produce a bond that would be equal to that of normal enamel. I had dental bonding done to close two tiny black triangles I had on the teeth next to my front teeth, and it looks awful. I went back today to see if he could fix it and it still looks bad. I thought my dentist was a cosmetic dentist but come to find out he’s not certified which I had no idea and the job looks terrible. Looks like whitish material lodged between my teeth and I am sad and regretting even doing it. Just thought if he said he would do it, it was an easy fix that would look nice. He said give it a couple weeks to get used to but he will refund me since I am not happy. I can’t even floss between the teeth except above the bonding. He wants me to come back tomorrow to try and fix it. I am afraid to have him do anything else. And researched more and found that certain dentists are actually certified for this. Is this something I can get fixed and done correctly? I just wish he would have said this isn’t something he specializes in. I just want my teeth back to where they were before this now and want my gums to settle down. What do I do??? Closing black triangles is really tricky. Fortunately, you a couple of excellent cosmetic dentists in the St. Louis area, and either of them could do a fine job on this for you. Black triangles are usually caused by receding gums. Here is a photograph of a case where that occurred. 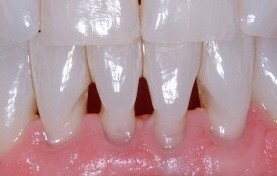 Black triangles from receding gums. In your case yours showed up after straightening your teeth with Clear Correct invisible braces. Now you said that they are tiny. Not seeing a photograph of your teeth, I can’t tell you my opinion about whether or not you need these areas bonded—you can figure that out, if you want to just have the bonding sanded off and go back to the way your teeth looked, or if you want the black triangles filled in somewhat. If you have them filled in, I’ll let you know several issues that make fixing these black triangles tricky. The first is that their shape can adversely affect the health of the gums. Simply adding bonding material to fill in the hole left by the gum–that will just create a food trap which will cause plaque and calculus to accumulate beneath it. This will cause gum disease. So the added composite has to be shaped skillfully so that there is no such trap created and then polished carefully to make it plaque-resistant. The best test of whether or not the shape is healthy is to floss between the teeth. If you can push the floss into the sulcus under the gum and then when you pull it up it pulls smoothly, that is a strong sign that the shape and the polish are excellent. In your case, you’re saying that you can’t even get the floss past the bonding material. This is a serious problem and needs to be resolved to avoid gum disease on these teeth. The second issue is that this is a difficult area to bond anything. To get the final result shaped properly, the dentist should be working some slightly under the gumline. Gum tissue oozes fluids. And if the gum tissue isn’t healthy, this oozing is very difficult to control. Those fluids contaminate the bond between the composite and the tooth, making it so the composite doesn’t stick. There are techniques for retracting the gum and controlling this oozing during the procedure, and those techniques have to be meticulously applied. The third issue is the esthetics of the case, and there are a couple of dimensions to esthetics at play here. You mentioned color. Teeth are quite a bit darker at the gumline than they are at the incisal edge, and many dentists won’t use a dark enough shade of composite here. Family dentists may not even stock appropriate shades, because they only stock general purpose composites that are used for fillings. Composites for esthetic work are different. And then the shape is another dimension. Just putting a blob of composite on the teeth to plug the hole isn’t good enough. The end result has to look natural, and it can’t be done in such a way as to compromise the health of the gums, as I mentioned above. I respect your dentist for his honesty in acknowledging his inadequacy here. I would recommend that you have him remove all the bonding material, refund your money as he has offered, and then, if you want this fixed, go to someone who knows what they are doing. There are sandpaper strips that can be used to polish off all of the bonding. After it is removed, you should be able to floss easily, get the floss under the gum, and the surface will feel smooth as you rub the floss up and down on the tooth surface. Hello Dr. Hall, 9 months ago I had dental bonding done on my four front teeth. There is quite a bit of composite on each tooth because I have been re-doing it every 3 or 4 years for 20 years. My question to you is, I see a bit of yellowing, is it possible to just polish them to try and whiten them again since they were done just 9 months ago? Thank you for your time! One of the big differences between composite bonding and porcelain veneers is that the porcelain is very hard and stain-resistant (it resists stains better than tooth enamel), and composite is much softer and much more susceptible to stains, so it has a much shorter lifespan. The good news is that with the composite bonding, usually those stains can be polished out, depending on the type of stains. But composite will also absorb stains into the actual substance of the material. Composite is composed of inorganic filler particles such as quartz or glass bound together in a plastic matrix. Certain colored liquids, such as coffee, tea, cola drinks, or highly pigmented fruit juices, will actually penetrate the plastic part of the material and become a part of it. This type of stain will not come out with polishing. But this staining also occurs more slowly and can take a couple of years to become noticeable. At the right is an example of this type of staining. You can see that the composite has retained its gloss. The discoloration is coming from deep within, as stains have been absorbed by the material. There are several preventive measures you can take to get the bonding to keep its nice appearance for longer. 1. First, choose an expert cosmetic dentist who stocks a full inventory of esthetic bonding materials. General dentists will typically stock general purpose composites that are actually impossible to polish to the high gloss needed to resist stain and look like enamel. The surface of the bonding should be a microfill composite that is polished to a high shine. 2. Second, don’t use an abrasive toothpaste. While Supersmile toothpaste is quite a bit more expensive than your typical Crest, Colgate, or other drugstore brand, those general brands have abrasives in them that will scratch the surface of your bonding. Some of the abrasives are worse than others. I always provided my bonding patients with a first free tube of Supersmile, because it has no abrasives but rather lifts stains off by chemically dissolving the protein pellicle on the teeth. 3. Fourth, beware of staining beverages. If you need to drink them, swallow them quickly rather than letting them sit in your mouth. And remember that hot beverages have more staining power than cold ones because they cause a slight expansion of the plastic, opening up microscopic pores that can be penetrated with the stain. Finally, I would seriously consider switching to porcelain veneers. I don’t know how much your dentist is charging for this bonding, but dentists who do it well will charge quite a bit. Which costs more–doing composite bonding six times over 20 years, or doing porcelain veneers once for those same 20 years? Porcelain veneers done by an expert cosmetic dentist can easily look beautiful for 20 years. Porcelain is harder than tooth enamel and more stain-resistant. But go to an expert cosmetic dentist for porcelain veneers–don’t ask your family dentist to do this. I would like to send photos of what we consider is a bonding error. My granddaughter (25 years old) had a gap fixed between her two front teeth, and then had her lateral incisors bonded to make them a little larger. She immediately remarked on the color difference between her front teeth and her lateral incisors. But the dentist then told her, “The color difference was to match your eye teeth.” But then later he told me on the phone that he used the same material on all her teeth. So these are two different stories. The central incisors look fine and the color looks fine, but he told my granddaughter that he used a darker color on her lateral incisors to match the eye teeth, but he told me he used the same color. He now wants further payment for a correction. He says to try whitening toothpaste too. I already paid $350 for whitening by tray and gel, and $900 for the bonding work. Her lateral incisors are a definitive blue/grey. 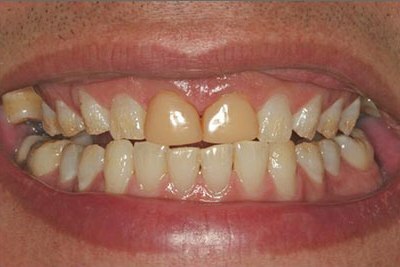 You can see in the after photo that the lateral incisors look substantially darker than the centrals. Actually, truth be told, the lateral incisors should be slightly LIGHTER than the central incisors—just slightly, and then the canine teeth are darker, in a natural smile. I think this dentist knows that, which makes it seem like he is trying to make excuses. So my answer is, yes, this is a dental bonding error, a cosmetic dentistry mistake. The teeth look fake and her smile doesn’t look natural. And you didn’t ask about the shaping of these two lateral incisors, but that looks off, too. The tooth color error is particularly noticeable and makes the case unacceptable, in my opinion. 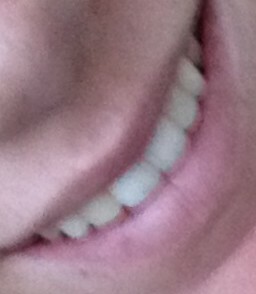 Like you said, they’re kind of a gray putty color and are actually darker than even the canine teeth. But then the next question is what do you do about this. You say that you’re okay with the work that was done on the central incisors. It looks like there was a chip in one of the centrals that he must have fixed and a gap between the two central incisors that he also closed. That much looks okay to me, thought the photo is a little fuzzy. There are two directions to take in trying to get some satisfaction from this dentist. You can ask that he fix it himself, or you can ask that he pay to have someone else do it right. Generally it is better, when you’re talking about cosmetic dentistry, to forget about trying to turn the first dentist into an artist. That just doesn’t happen. So I usually recommend getting someone else who can do it right and getting some compensation from the first dentist to cover those costs. But in this case it looks like he maybe did okay on fixing the central incisors (though the photo isn’t as sharp as I would like). And while the shaping of the laterals isn’t great, you seem satisfied with that and are only concerned about the color. You’re welcome to take this dentist my email here. I would recommend not being confrontational. Like I said, it appears that he did a nice job on the central incisors. See if you can get him to agree to re-do the bonding on the laterals. Bleaching isn’t going to work. Toothpaste isn’t going to work. I kind of think he knows that, too. The color is embedded in the bonding, and it needs to be removed and replaced with a lighter color. It needs to closely match the central incisors, maybe just a teeny tad lighter. And then, of course, this needs to be at his expense. You paid to have a nice smile, and you haven’t gotten it yet. He should make good on the work.